I wanted to round up all the items I have made to stuff. I didn’t realize until now, but I missed one! The Baby Bunny deserves a shout out too! The rest are listed below. Working from left to right from the photo above. And I don’t want to forget the amazing cat I made! Although I didn’t write a pattern, I did link all the patterns that I used to put it together. I just came across this site today and so far love everything I’ve seen. But how does one go about getting the patterns? 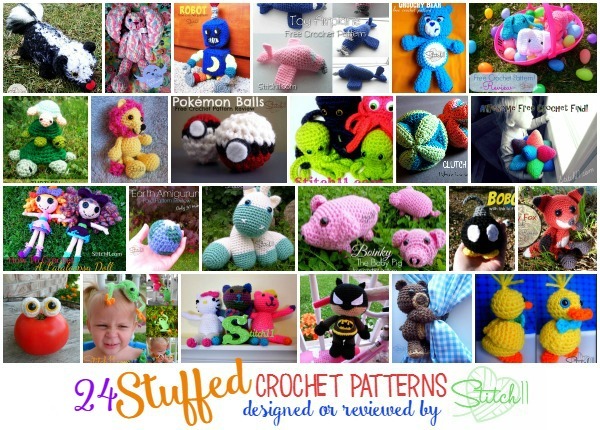 I do a lot of charity knitting and crocheting so free patterns appeals to me. It seems that no amount of “clicking” gets me anywhere. Click the name of each project. They will take you to my blog post with the pattern or to my review where I will have them linked. I usually will make the reviewed patterns linked in bold blue letters. Sometimes I will add >>>HERE<<< to try to make it easier to see. If you read the reviews you will find it though..